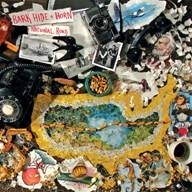 Bark Hide and Horn embark on "National Road" next week! Debut out August 12th via Boy Howdy Records. 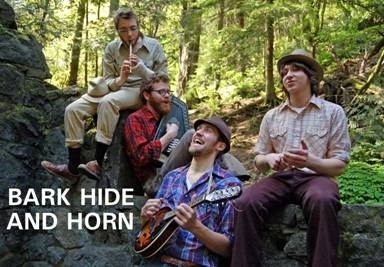 Bark Hide and Horn is a four-man folk-rock orchestra hailing from Portland, Oregon. National Road, the band’s first full-length, uses the full range of colors in Bark Hide and Horn’s sonic palette. Digging deep into a basement closet full of stringed instruments, horns, odd percussion, and old electronic noise-makers, the boys flesh out their live sound with rich orchestrations, choral arrangements, and sonic experiments. Inspired by Andy’s collection of old National Geographic magazines, the record tells a tale about Melville Bell Grosvenor, editor of the magazine from 1957-‘67. The grandson of Alexander Graham Bell, Melville was an innovator and (in Andy’s imagination) a madman. Possessed by the spirit of his grandfather, Melville takes a mystical journey through the perspectives of the silenced voices in National Geographic articles -- an enslaved honey ant, a lovelorn tree snail, the disgruntled wife of a staff writer, even Ham, the first chimpanzee in outer space. West Coast Performer explains, “In this way, Furgeson was much like fellow Portland storytelling songwriter Colin Meloy, able to stitch these ideas and their subsequent imagery seamlessly into catchy, sing-along pop.” With its wide variety of voices and sounds, National Road swells up like our bloated nation, bursting forth as the singular vision of an up-and-coming band. Since forming in 2005, Bark Hide and Horn has been invited to share the stage with notable artists such as Cave Singers, Norfolk and Western, Laura Gibson, and A Weather. Bark Hide and Horn’s National Road will be released August 19th via Boy Howdy Records and you can catch their dynamic, passionate live shows as they embark on the west coast roads for the next two weeks. Download MP3s and check out the full tour dates below.